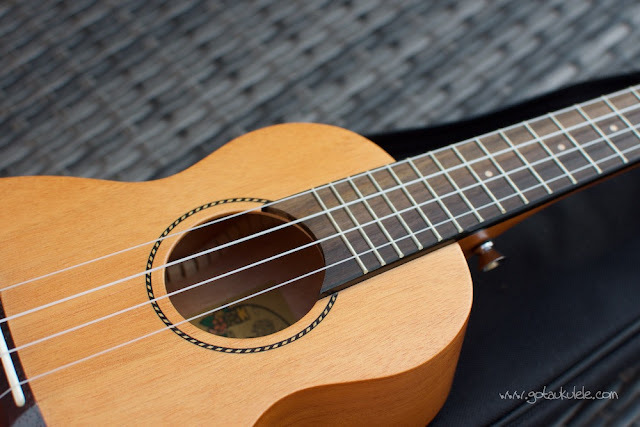 A new brand for the Got A Ukulele reviews bench this week, and one with an unfortunate sounding name - The Kaka KUS-25D Soprano. Now let's get that name over with before we get into the depths of the review. My apologies if this sounds childish, and I fully appreciate that it may not mean something to you in certain parts of the world, but.... In the UK and I believe in the US, the word 'Kaka' is more commonly associated with something you would pick up after your dog or find in a baby's nappy or diaper. 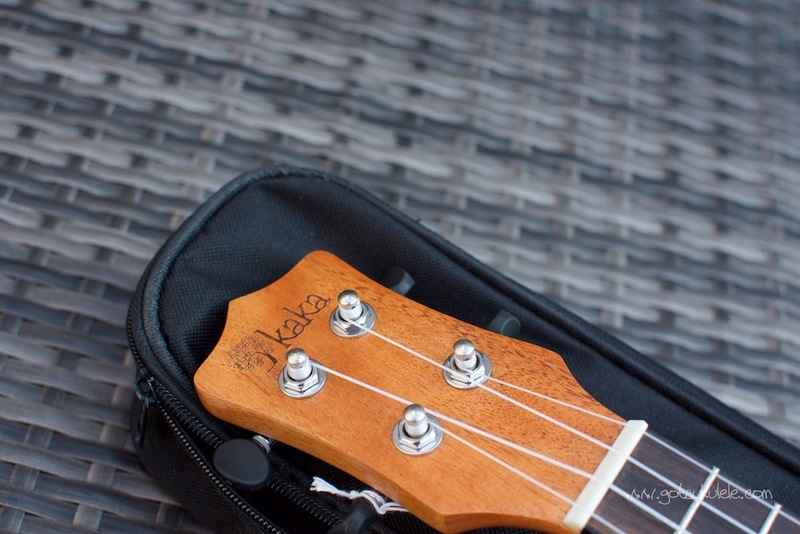 I was actually staggered when I saw somebody had named a ukulele 'Kaka' for that reason. Language differences I suppose and you may not see the point I am making. 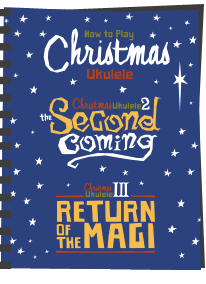 Now it may also be that they were trying to sound suitably Hawaiian (with a name starting with K) or perhaps sound like that other well known four letter named ukulele brand - but I really have no idea. Whatever it is, it's lazy branding in my view. 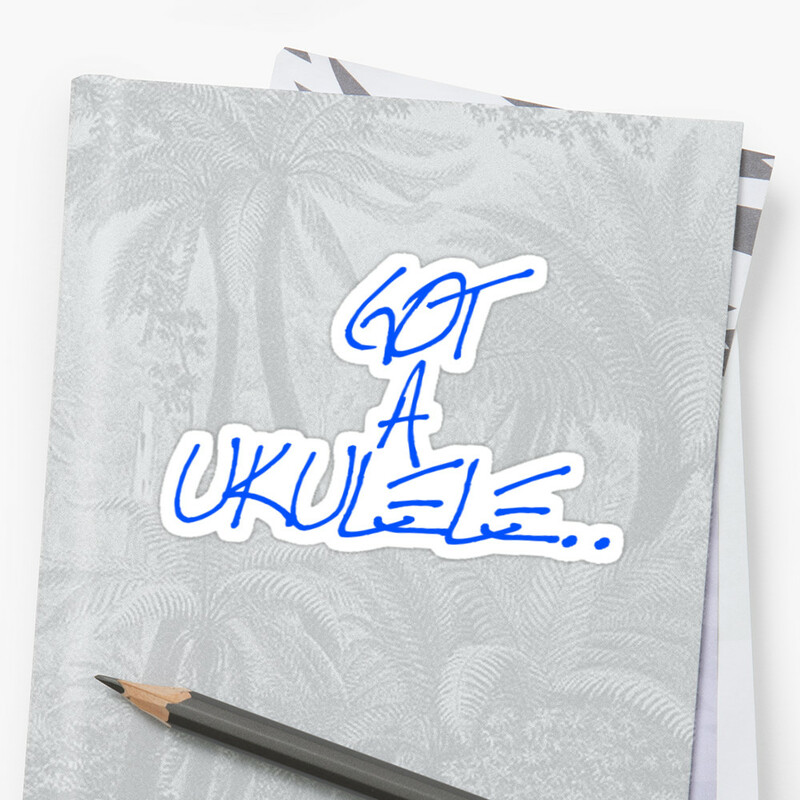 Anyway, Kaka ukuleles seem to be all over sites like Amazon at the moment and no doubt are attracting attention on account of their low prices and generous package deals. This one is no different, and costs around £60 or $70 to purchase. A very attractive price, and as you will see comes with a variety of extras to further sweeten the deal. I have no doubt that many people are looking at these and considering them. It's a standard shaped soprano instrument, with a double bout that is all finished in satin. My first gripe with Kaka is in the product description that I am seeing go out on certain stores (like Amazon). It is being listed as being made from an 'AAA grade solid African mahogany top' and 'AAA laminate african mahogany sides'. 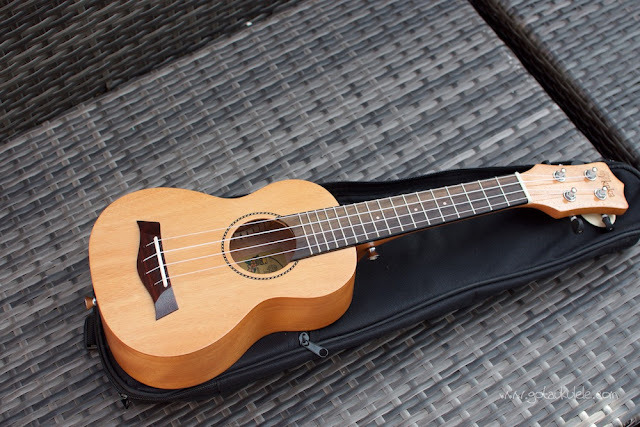 Now at least they are not comitting the cardinal sin of misleading the buyer into it being solid when it isn't, but I would say this: There is NOTHING 'AAA' grade about the wood this ukulele is made from. I don't even know what AAA means or who (if anyone) certifies such silly descriptions, but I am sure you will agree that it is intended to conjure up something 'special' or 'rare'. In reality, the woods on this instrument are some of the plainest and most dull looking pieces of mahogany I have ever seen in all my instrument reviews. Mahogany is not the most striking wood, but this is pale and devoid of any grain stripe or pattern. AAA? I really don't think so, and consider that to be marketing speak of the lowest order. Looking at it more closely, the top is also very thick for solid wood - the bane of many cheap end 'solid wood' offerings as they are made to such a low budget that it is safer to make them thick than have them split after they have been bought. The downside to thick tops is that they sap all projection and power from the instrument when played. In short they are harder to vibrate through the the action of the strings. The sides are in two pieces of mahogany laminate and the back is slightly arched. The whole thing is finished in a satin gloss that allows some of the wood pores to show through. The finish is quite nicely done for the price to be honest with no bare patches, pools or bubbles. I've seen much much worse. Decoration wise, we have no edge binding but the sound hole is decorated with an inlaid rope marquetry design. It's nice to see this rather than a decal. The bridge is interesting on account of it being neither a tie bar or slotted design. The strings actually go through holes in the bridge and are knotted on the inside of the instrument. Kind of like a pin bridge but with no pins. 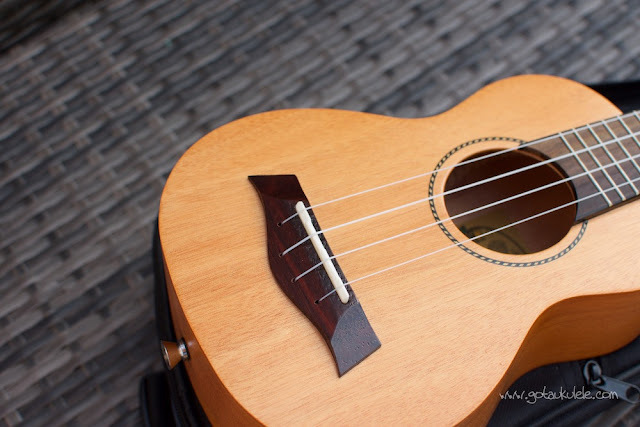 For me that makes for fiddly string changes as you need to feed them through and fish them out of the sound hole. The bridge itself is made of glossed rosewood and is a less than usual design. Kaka say that they have patented this design of bridge, but I wonder how. To me it looks just like the bridge design used on Taylor guitars.. I do like the design of it, but it's hardly unique or groundbreaking. Sitting in the bridge is a compensated bone saddle. Compensation on a saddle is a nice thing, but to me it seems totally pointless when you consider that the bridge on this one is visibly set in the wrong place. That is to say - the whole thing is on a slight angle. Things like that are pretty fatal for an instrument as they will throw off the intonation up the neck. We shall see. Looking inside, we have an otherwise tidy build, with notched kerfing and tidy bracing. Also adorning the body are two strap buttons with one on the base and one on the heel of the neck. This is a nice addition. Up to the neck, this is made of mahogany and has very visible joints at the heel and half way up the neck holding its three pieces together. Sitting on top of this is a rosewood fingerboard which is a little uneven in colour but otherwise in good enough condition. We have 12 nickel silver frets to the body and a generous (for a soprano) 17 in total. This is a nice touch as most cheap sopranos have less and you tend to find you run out of notes for some pieces of music. They are all dressed very well and the edges are hidden by painted edges. I do like how the end of the fingerboard extends down to the sound hole and follows the curve. We have outward facing fret markers at the 5th, 7th and 10th, inlaid in pearl, and thankfully these are repeated on the side. The nut appears to be bone and is cut far too high (as you will read below). This moves on to an interesting shape of headstock with the Kaka logo engraved in in. I like unusual shaped headstocks, but think this one is just too narrow. 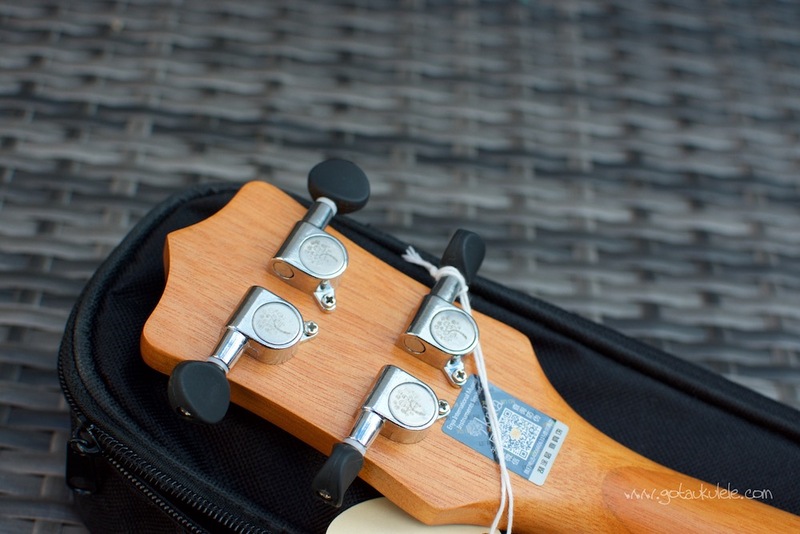 It means the tuner posts are far too close together as shown by the severe break angle of the G and A strings as they leave the nut. I'm not a fan. Tuning is provided by silver sealed, unbranded geared tuners with Kaka logos on the cover plates. The small black rubber buttons are nice but the tuners themselves are very cheap. They hold well enough, but I never like tuners where some are easier to turn than others. At the end of the day, they are ok, but much prefer friction pegs on any soprano as they are lighted. Also on the back of the neck is a sticker of authenticity. 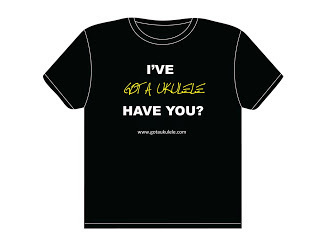 I will leave you to make your own judgements as to whether that is really necessary or not with a fifty quid ukulele.. Completing the deal is quite a package. 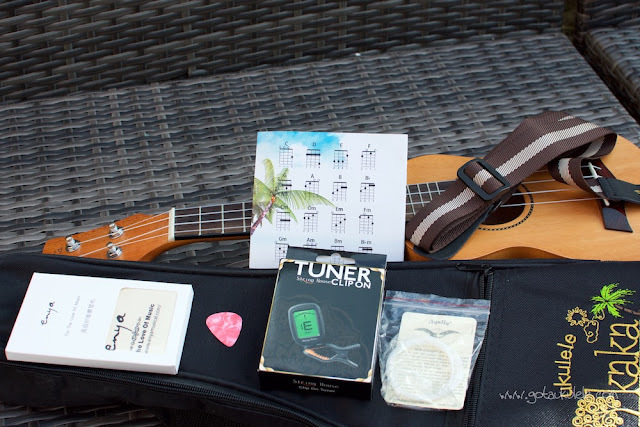 First we have fitted Aquila strings, but the Kaka also comes with an embroidered gig bag, a chord chart, a pick, a strap, a polishing cloth and a clip on tuner. Also in the bundle was an intriguing back of white strings with an Aquila card. I found this odd as Aquila strings are always packaged with colour coded wallets so you know which is which. These are just four strings in a plastic bag. You would have no idea which was which rendering them kind of useless. To the best of my knowledge, Aquila do NOT provide their strings this way, so I would be interested to hear their take on this and whether they authorised it. So, a lot for your money, but some issues for me. On to the playing. First of all, it feels nice enough in the hands on account of that satin finish and the tidy fret board. Sadly the whole thing is neck heavy and not balanced at all. That's another major gripe for me. I don't like holding an instrument that feels like the headstock is trying to drop to the floor. But the biggest issues I have with it are on volume and projection and one of intonation. Firstly, this is not a loud instrument. In fact it sounds strangled and mute. I can only put it down to that thick top, but you really need to hammer these strings to get some volume out of it. In the review video below, I manage that, but believe me, I was strumming it hard. A real shame, if not fatal. 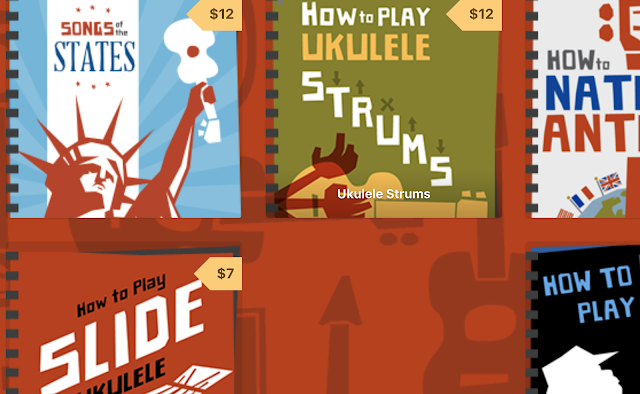 I guess some people like quiet ukuleles! But most displeasing for me was that intonation. Tuned accurately at the nut, several of the strings sound off further down the neck. 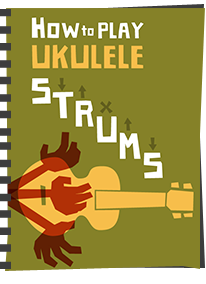 Most strings go sharp when fretted at the first fret and it generally sounds dischordant. Now, a lot of that can be sorted with a thorough setup, and certainly the issues with the high nut can certainly be fixed. But I do wonder how much of that is down to the badly placed bridge - that is a much harder one to overcome. Naturally, others may not have that bridge issue and with a setup you might be able to get them playing in tune. It's still quiet though! Sound wise, it's rather uninspiring aside from the above. No real depth to the sound. There is some reasonably good sustain, but otherwise I found it sounding a little confused and muddy. 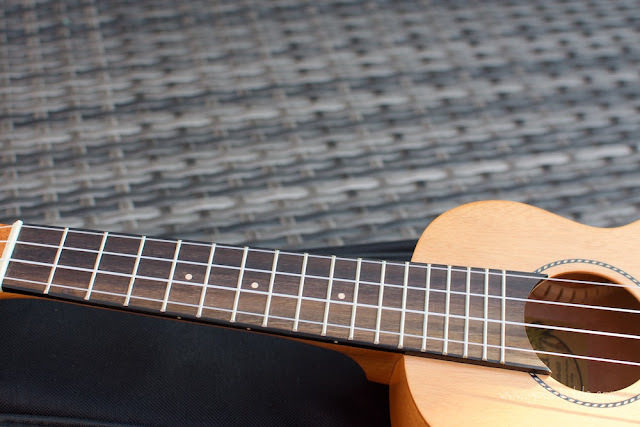 It looked like it actually hurt you to play this ukulele. cheap ukes skimp first on quality control. Perhaps - but there is not AAA grade on that link. And if AAA is something better, I can assure you - there is nothing impressive about the wood on this Kaka! The A-grade system is often applied in veneers as well, so there's not really a problem here. In veneers, it's most often used to describe the quality of the grain design. But there is also nothing really straightforward about it. Take rosewood veneer, where some vendors might be looking for a very wild pattern, while others might save all there letters for a very parallel design. Yeah - I know - was being facetious because the grading system is then devalued to the point of it being meaningless when cheap brands like this use the term as a means to selling something that isn't what they claim. Whilst this is a solid top, it is about the most boring, simple, pale piece of mahogany I have ever seen. 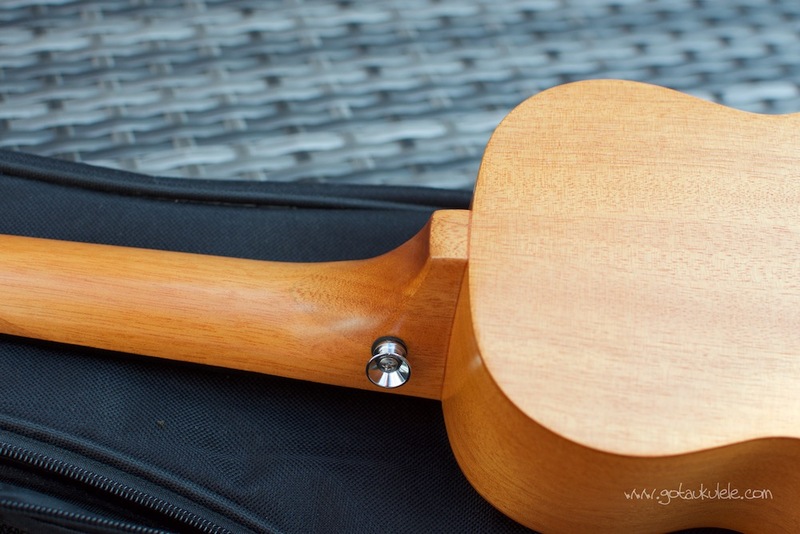 In fact it looks like those laminate basswood ukes for $20 that are painted in brown stain. If that makes this AAA grade, then the grade system is broken! I read this as Kala this first time I saw it and couldn't understand the opening line of your post! These ones are not as appealing to me as the one you show in your review, and when I look in other websites it seems like the price of the V2 sun has risen up just a little bit over my expectations considering the shipping rates. 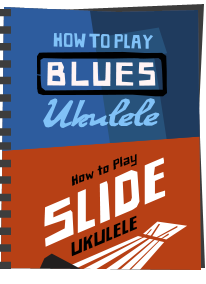 So now I'm trying to decide between those two options, the Flight NUS310, or the one that appears in SUS as "Brunswick BU4S Soprano Ukulele - great beginners uke!" 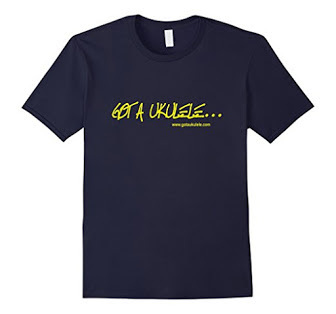 (link here:http://www.southernukulelestore.co.uk/Product/0__dot__383/Brunswick-BU4S-Soprano-Ukulele-great-beginners-uke! ) since these are the one I could really (and sadly) afford as a college student. Could you help me with the choice? Thank you very much and I hope this wasn't too annoying.